Now that we’ve released our Walter camper kit, which is for the high roof, 136” wheelbase Promaster, some of you may feel torn between which van to choose. Do you choose Walter, or Wally, our original Promaster City camper van conversion. For some it’s an easy choice, but for others it’s a dilemma. For those of you having a hard time, in this blog post we’ll go through and propose a series of questions, stopping to reflect on each one. 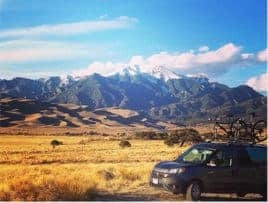 We have quite a bit of experience with both vans – camping, traveling, and generally navigating each one on the highways, interstates and dirt roads. Therefore, we can help narrow down the right Wayfarer Van for you, ensuring that you’ll be happiest with your decision. First, where do you live and will your camper van double your daily driver? If you live in a densely-populated area you’re probably leaning toward our smaller, Promaster City camper. It’s easy to maneuver, it’s less stressful in traffic than the big Promaster, gets better gas mileage around town, and fits underneath a covered parking lot or in a small garage. Those are all benefits if you’re also using it as your primary vehicle. But, say you live on the outskirts of town and have the liberty of keeping your camper van at home, using a smaller vehicle during the week. 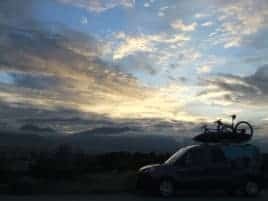 If you’re just using your van for weekends and long trips, or live in a rural area where you don’t have to worry about driving a bigger van around, then we’re back at square one and can move on to the second question. How often do you go camping and for what duration? For most of you the purpose of getting a Wayfarer Van is because you want travel and camp more, no longer excusing yourself from getting out there and realizing all those adventures you wish you had. However, you don’t want a big lumbering RV because that would limit the places you could go—but you want something more comfortable than a tent. To determine the right Wayfarer Van for you, it’s important to ask yourself: how often do I anticipate going camping and for how long? If you think you’ll be going out frequently, two or three trips a month but only for the weekend, then we may recommend the Promaster City camper van. However, if want to take an extended trip once a month, for 4-5 days or longer, then we would probably recommend the larger Promaster. For short weekend trips you can gauge fairly accurately what the weather is going to be, thus making easy decisions on what to pack. But, if you’re traveling for 4 days or more, and most likely further distances, then it’s a little more difficult to anticipate what to pack. You may need to bring a bit more gear to be flexible with the changing weather and geography. Therefore, for longer trips we recommend Walter, the high roof Promaster. Another question to ask in terms of duration: how long do you anticipate your camping season to be? We love the little Promaster City during the summer because we’d much rather spend our time outside. We cook outside, sit outside and rarely, perhaps because of the short but frequent, Colorado afternoon rainstorms, are we sitting or eating in the van. If you anticipate using your van primarily during fair weather then maybe it’s the small Promaster City that would best suit you. If you want to extend your camping season to nearly year around then we recommend the bigger Promaster. During the summer, you can always be outside but during cold weather it’s easier to stay warm and comfortable in Walter. You can always have your bed made in Walter, it’s easier to cook inside, and there’s a lot more room to stay comfortable in it (with a small heater). For us, we like to ski or snowshoe, so we camp fairly frequently in the wintertime. There’s also a certain beauty in winter that makes the nip from the cold worth it. So, if you anticipate having a year-round camping season, or perhaps it’s something you would like to try, then we recommend Walter. Lastly, price. Which van is better suited for your camper van budget and travel budget? At Wayfarer Vans, it is our primary goal to get you in a camper van and out in the great outdoors more comfortably and faster. It is also our purpose to make your dream of owning a camper van more affordable, leaving more in your pocket for the most important thing—travel. On average, for a used Promaster City, plus our conversion kit, you can be in a daily driver camper van for about $22,000 or $25,000 if you buy brand new. For the 136”, high roof Promaster, if you buy used, you can be in a larger more comfortable camper van for about $29,000 or $38,000 if you buy new. From our experience, the Promaster City gets on average, 25mpgs, with our roof pod and fully loaded with all our camping gear. For the high roof Promaster, with all our camping gear, we can squeeze out about 19 mpg. Therefore, for weekend trips you’ll spend less in gas and travel in the smaller Promaster City. For extended trips you’ll spend more in gas but will save more in general travel because you’ll have the ability to pack more along with you, cutting down on stops for groceries and the occasional hotel room or Air BnB for a shower and to recharge your devices. We hope that this has helped you weigh the options. Please email us if you want to talk through your options a bit more—we’re happy to chat and discuss your needs and which camper van might be better suited for you. Buying a camper van is a big step and it isn’t necessarily the actual purchase of the vehicle, it’s the nervous excitement and anticipation of how a camper van will enable you to travel, camp, and do all those things you have always wanted to do. We and other Wayfarer owners know that this step is often the most difficult part. Therefore, we are here to help you through that decision because we know how great the feeling is when you hit the road for the first time, and all the other times after that, in your camper van.